April 28- First Holy Communion 10am Mass. 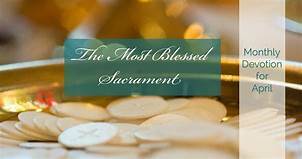 May 11- Sacrament of Confirmation at 5pm Mass. May 12- St. Peter Catholic School First Holy Communion at 10am Mass. The Knights of Columbus invite you to pray the Rosary with them every Sunday morning at 7:30am with Willy Trujillo and 9:25am with Chris Ruiz. As a parish, we also pray the Rosary on Tuesdays and Thursdays at 11:30am and Fridays at 8:00am. Religious Articles Shop is located in the Sacred Heart Hall. The shop is open following weekend masses and during regular office hours. Augauill be held August 19th at 11:30 am in the church basement.